Home Historical Mysteries Bermeja Island – The island that vanished ! Bermeja Island – The island that vanished ! 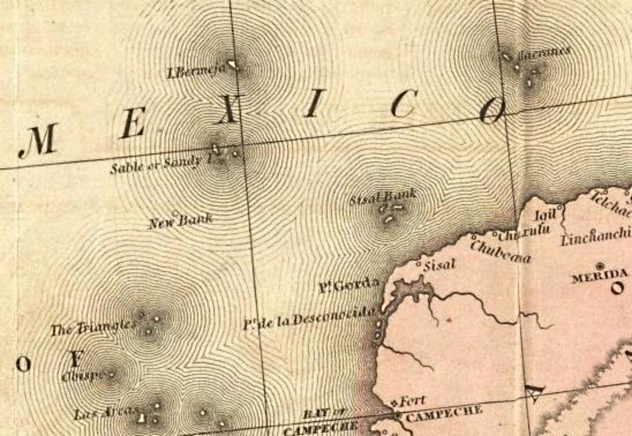 On maps dating as far back as the 1700s, Isla Bermeja was shown off the Yucatan Peninsula’s coast, at a greater distance than any other island claimed by Mexico. The island was just what the country needed to extend its claim on offshore oil and stop the United States’ encroachment on Mexico’s interests in that department. In the 1970s, Bermeja Island served as a marker for Mexico to set its 200-nautical-mile economic zone. Just about 20 years later, the island disappeared without a trace. Along with the island went important documents containing a treaty regarding major oil reserves within the island’s region. The disappearance of these documents immediately gave rise to conspiracy theories that the CIA had something to do with the vanishing island, ensuring that the US would get the oil. The main theory has it that the CIA actually blew up the island in order to expand the US’s economic zone. The island is mentioned in a 1998 book about Mexican islands, disregarding the fact that a fishing expedition party already reported that they were unable to locate it the previous year. Bermeja Island was found on historical maps between 1535 and 1775, after which it also mysteriously seemed to vanish from any geographical records, right up until 1857, when a US map once again included it. The timelines vary according to different sources, with some saying that the Mexican government actually went looking for the island in 1997 but were unable to locate it. Further research in 2009 also didn’t turn up any missing islands, stirring further confusion as to whether the island ever actually existed. The mystery of Bermeja Island seems likely to remain for a while.